Mona Saudi, The Nile Obelisk, 2003. 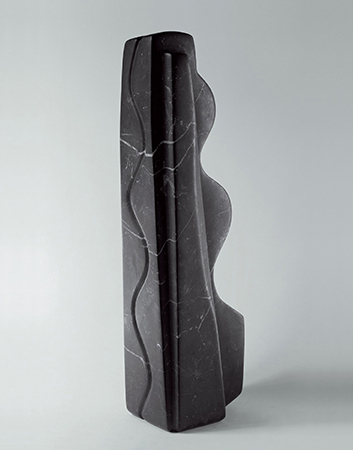 Black marble, 53 x 17 x 12 cm. Courtesy Lawrie Shabibi and the artist. Lawrie Shabibi is pleased to present Poetry in Stone, the first solo exhibition in the UAE for renowned Jordanian sculptor Mona Saudi. Featured in this exhibition are seven sculptures from the period 2003–12. Mona Saudi’s sculptural practice stretches over five decades, creating forms full of vitality, beauty and a clear sense of equilibrium. One of the very few Arab women artists to pursue sculpture, her achievements and unique style place her as an important figure in the history of modern Arab art. A central theme of Saudi’s work lies in creating an organic connection through her materials to life itself. To quote the artist: “sculpture is a pure exploration of form, an endless process of research and creation where the variations are infinite.” Drawn to the Arabic expression takween, roughly translated as creation or formation, she named her first sculpture in stone Mother/Earth (1965) and frequently returns to ideas of fertility and growth. Always starting with basic shapes, the square, circle, cylinder, rectangle, she goes on to give them a life of their own creating new, graceful compositions. Saudi is a sculptor who lives and breathes her Middle Eastern heritage and revels in using different kinds of stone from many parts of the world; but predominantly from the region: black diorite from Syria, Lebanese yellow stone, South American marble, African granite, Jordanian jade and pink limestone from her native Jordan. Another important element of Saudi’s artwork is her love of poetry, typified by a series of seven silkscreen prints of drawings made between 1976 and 1980 inspired by the writings of Palestinian poet Mahmoud Darwish. Phrases from Earth Poem, Hymn for the Green, Her Image and Suicide of the Lover, become part of the composition of her drawings. The works relate clearly to the sculptural forms she creates, with their strong graphic line and totemic imagery. Mona Saudi (b. 1945, Amman) is a Jordanian sculptor, who studied at the Ecole des Beaux-Arts in Paris. Recent solo and group exhibitions include ones held at the Mosaic Rooms in London, Musee d’Art Moderne, Paris, National Museum of Women in the Arts, Washington D.C., the Institut du Monde Arabe, Paris and the British Museum, London. Her works are featured in the collections of the National Museum for Women in the Arts, Washington DC, the Barjeel Foundation (Sharjah), The National Gallery of the Fine Arts, Amman, Jordan, the Sharjah Museum, UAE, The Khaled Shoman Foundation, Amman, Jordan, the Sursock Museum, Beirut, Lebanon, Dar Al Athar Al Islamiyya, Kuwait and the Museum of Modern Art, Kuwait, the Ministry of Culture, Cairo, Egypt, the Assila Museum, Morocco, and the French Embassy, Amman, Jordan. Recent acquisitions have included those by The British Museum and the Sharjah Art Foundation. Mona Saudi currently lives and works in Amman and Beirut. Lawrie Shabibi is a contemporary art gallery housed in Dubai’s Alserkal Avenue. The gallery’s programme supports international contemporary artists mainly from the Middle East, North Africa and South Asia. By holding a regular programme of exhibitions, screenings and talks, publishing catalogues and participating in international art fairs, the gallery engages the wider local and international community.